CNN's John D. Sutter is on a quest to kayak the San Joaquin River from Friant Dam near Fresno to San Francisco Bay. 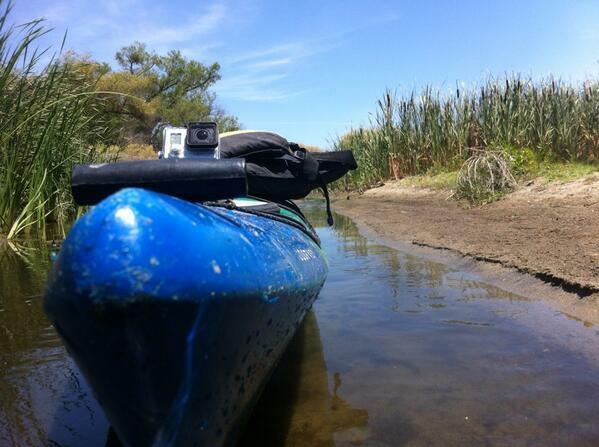 Journalist John D. Sutter is on a quest to do something that many valley residents do, kayak on the San Joaquin River. But instead of going for a short trip from Lost Lake Park to Highway 41, he has a much longer journey in mind - Friant Dam all the way to San Francisco Bay. Earlier this year, the non-profit advocacy organization America's Rivers named the San Joaquin as the "most endangered" river in the United States. That designation prompted Sutter to travel to the Central Valley to tell the story of the San Joaquin, as part of his "Change the List" project with CNN. Along the way Sutter has talked to dozens of people with deep ties to the river, from fishermen and environmentalists to farmers and water managers, and has documented his journey on Twitter. Sutter joined us on Valley Edition from a spot along the river in the Grasslands Ecological Area in Merced County. We talked about his journey, the people he has met, and the challenges of navigating a waterway that is dry for around 50 miles. Healthy Rivers: Will Wealthy Fresnans Block Access On The San Joaquin? This is part of a Valley Public Radio original series on how the health of rivers impact the health of communities produced as a project for The California Endowment Health Journalism Fellowship, a program of USC's Annenberg School of Journalism. This past weekend’s summer-like temperatures mean the state’s already meager snowpack is quickly melting. And for much of the Central Sierra, those waters will eventually find their way into Millerton Lake, behind Friant Dam. But as FM89’s Ezra David Romero tells us in our series Voices of the Drought, managing those waters is a tough job, especially this year. The U.S. Bureau of Reclamation announced today that for the first in this history of Friant Dam, the oldest water rights holders on the San Joaquin River - the Exchange Contractors - will begin to draw down water from Millerton Lake. The move pits farmers in Merced County against those on the east side of the valley from Fresno to Kern, and underscores the divide between the holders of historic water rights, and those whose supplies came about in the middle of the 20th century. The California drought is becoming a source of tension between homeowners and farmers in the Southern Central Valley. Farmers are seeing unprecedented reductions in their allotments to surface water. Homeowners are watching their private wells run dry. Pauline Bartolone has more about how people in the Fresno area are tapping into underground water. The home where Ruth Griffin planned to retire looks like it’s an island in a sea of almond orchards. The area around Los Banos isn't just a stopover for valley travelers along Highway 152 who are headed for the Central Coast. It's also a vital rest stop for millions of birds from across North America on the Pacific Flyway. Ric Ortega: "If you come out here, you really don't see it all off of any of the major highways. But here we have something that definitely at least from an ecological perspective is equivalent to Yosemite Valley."